01.01.2011: Happy New Yer 2011! 24.11.2010: Coming soon: Model of Waterworks Považská Bystrica! 30.09.2010: Model of the "Mestská estakáda" bridge was finally more than a year accepted to the 3D Buildings layer in Google Earth, so it appears automatically! 10.07.2010: First birthday of the project "Virtualna Povazska Bystrica"
09.06.2010: New model of City estacade (Highway Bridge) was finished, download HERE. 27.05.2010: Model of the fountain "Three doves"will temporarily not appear automatically in Google Earth because of reconstruction of the model, and new textures will be added. 17.04.2010: section "Map" is temporarily unavailable, please use map from Google 3DWarehouse database..UPDATE: Map is now working correctly. 11.04.2010: In the "Objects" was added to filter accepted/ not accepter models for better access to certain models. New filter "Featured models/Obľúbené modely", which brings together a unique and interesting models. 08.04.2010: The section "gallery" is under reconstruction, the pictures in the gallery will be currently unavailable. 04.04.2010: 100 models in database of project "Virtuálna Považská Bystrica" ! 16.02.2010: Highway bridge "Mestská estakáda" has more than 3000 unique views! 25.01.2010: Tomorrow (26.1.2010) will be in sales the new number of PB Novinky including the article about the project Article Virtual Povazska Bystrica! 14.01.2010: Because of test period on high schools were added no new models. Soon will be released several new models. 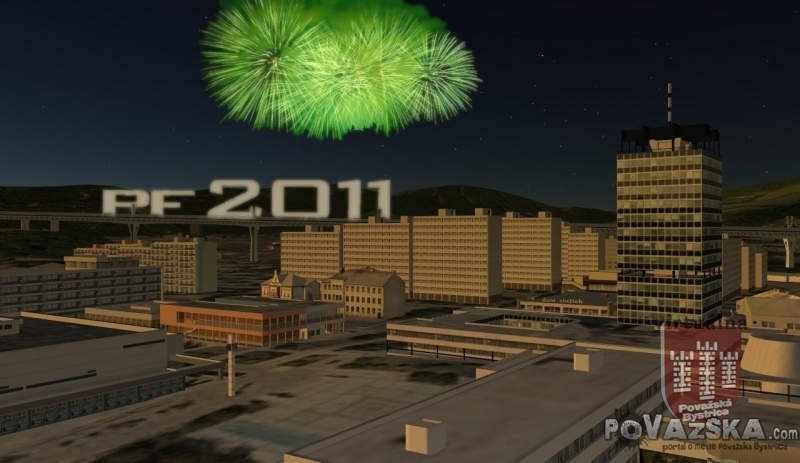 01.01.2010: Link to icons of all models in Google Earth..
31.12.2009 1.1.2010: Happy new year 2010 ! 26.12.2009: Last building in Central city zone was created. All created buildings are in Objects. 24.12.2009: Pleasant Christmas wishes to all of you from the modellers of Virtualna Povazska Bystrica. At the same time I want to thank to everybody who contributed in any way or assist on this poject. 21.12.2009: Starting today, the weekly newspaper MY--Noviny stredného Považia is in sale, in which there is an article on the Virtualna PB with pictures. 16.12.2009: New three models were added to database together, a block of flats 54, 55 and 56 in "Stred"
16.12.2009: 2000 unique views of model "Mestská estakáda"
01.12.2009: The Google team declared a global competition "Model Your Town Competition", where through quality models entire cities and projects around the world may be promoted. The deadline for applications is March 1, 2010. Before applying for the competition with the virtual PovazskaBystrica project, I want to create as many models as possible. Modellers or photographers of the buildings in the city (for example Tibo/ Printers / prefabs in Stred) report to virtualna@povazska.com. Thanks. 30.11.2009: "Thanks" to the requirements on models from the google team, more than 12 models had to be modified. So in the coming days it may happen, that some of the models will not show automatically in Google Earth or will be displayed incorrectly. 25.11.2009: Today was an interview for the newsletter MY Stredneho Povazia, that will be issued before Christmas ( 22.12.09 ). 23.11.2009: Due to problems with model approvement, the model of ABSO is now excluded from the 3D Building layer in Google Earth. While we are working to solve this problem, it is possible to download the model of ABŠO into Google Earth manually. 14.11.2009: After nearly a year since the first model of ABSO was created, it was now modified. Details were added and textures adjusted so that the model would look even more realistic. An updated model can be downloaded from 3DWarehouse. The automatically displayed version is loaded into the database within a few days. 13.11.2009: The author of the project "Virtualna Povazska Bystrica" R. Hodás in cooperation with Ing. N. Chromek (www.pilotclub.sk) created a detailed model of the dominant of Bratislava - New Bridge. 01.11.2009: No new models were added lately. This is due to the lack of time photographing objects in the city. Help the project "Virtualna Povazska Bystrica"! Take photos of the buildings in the city and send them to us! 21.10.2009: Model of Mestská estakáda modified: the shape of pylons with ropes changed according to current visualisation. When loading the model in Google Earth, do not forget to delete the previous version of the model ( "warehouse model" in the items of the menu on the left in Google Earth). 15.10.2009: Become a fan project for the Virtual Povazska Bystrica on Facebook! and be informed about all new models in the database imediately after the publication of the model! 10.10.2009: Slovak language is now supported at 3D Warehouse. Quick link to 3DWarehouse-click on the city coat on the left of the main picture on this page. 25.09.2009: Added 3 new models: Mansion "Orlove", VUB and SLSP. 16.09.2009: Added a short tutorial of creating the model in the section "How it works". 05.09.2009: Help the project "Virtualna Povazska Bystrica"! Get photos of the buildings in the city and send them to us! 01.09.2009: 30 models in our database! 01.09.2009: Launched RSS for "Povazska Bystrica" collection in 3D Warehouse, also available on this website, bottom right. 15.08.2009: One thousand unique views of model ABSO! 21.07.2009: Launched Youtube Channel "VirtualnaPovazska" !